How to Read Kindle MOBI eBooks on iPad Air/mini/4? Instead of holding a traditional paper book, more and more book fans are keen on reading books on an eBook reader, such as Apple iPad and Kindle Fire. The high-definition and readable display and paperback size of these eBooks allow you to sink into an author's world just as they do with a physical tome. If you used to use Kindle Fire/Paperwhite and now you just switch to an iPad Air/mini/4, you must have a lot of new books on the Kindle that you haven't read and want to move them to the iPad for continued reading. However, Kindle books are in MOBI format that is incompatible with iPad. To read Kindle eBooks on iPad, you must think out a way to convert Kindle books to iPad supported format first. Read more: How to Make/Design Your Own ePub Books? Check if your Kindle books are saving as MOBI format (some are in AZW or PRC format), if so, you can depend on Coolmuster ePub Converter or ePub Converter for Mac, which can turn all your Kindle MOBI eBooks to iPad supported ePub format easily in 3 steps: Import books - choose conversion type - start to convert. This software will perfectly preserve the quality of the books and output your desired books in seconds. Certainly you can read Kindle books on iPad without doing format conversion because you can directly install "Kindle app for iPad" app from iTunes Store, and then launch the app on your ipad to read Kindle books directly. Just select the method according to your need. The following paragraph is the detailed guide showing you how to read Kindle MOBI books on iPad by converting MOBI books to ePub format with the help of Coolmuster ePub Converter. 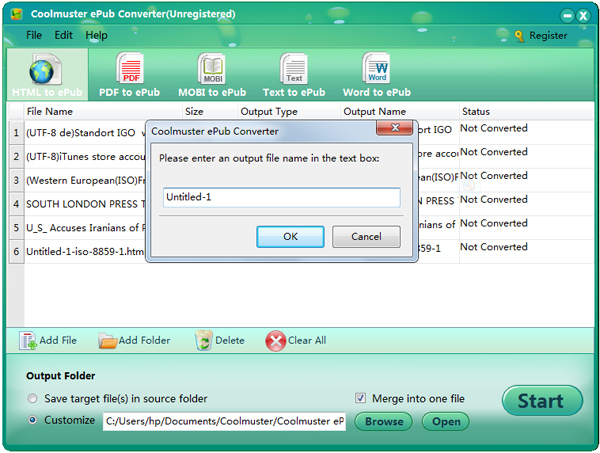 First of all, please download the free trial version of the Converter with the following button. It can be installed on both Windows and Mac computers. Just choose the right version for you. Read more: How to Read MOBI Books on iPhone/iPad? Tips: The following guide is based on Windows version, but the operations are suitable for Mac platform, too. 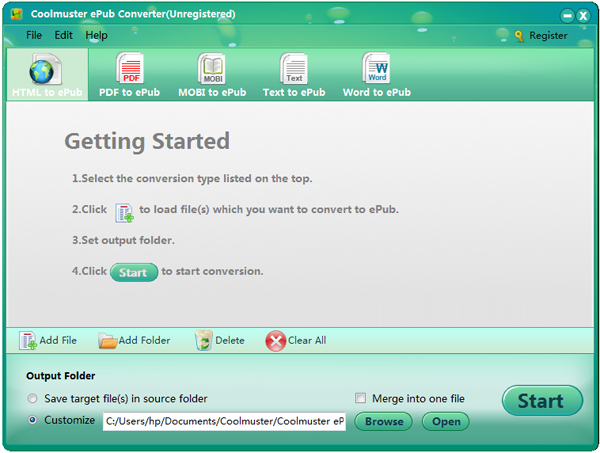 After downloading and installing the recommended software, you can launch it and then choose "MOBI to ePub" option among the five conversion types. Then,click "Add File" or "Add Folder" or use the drag-n-drop operation to import the target Kindle MOBI files into the program window. You can save the converted files in Source Folder as default. Otherwise, you can tap on the "Customize" button to choose an output folder for saving the converted ePub books. Click the "Start" button and you can also define the output name for the converted ePub files. Now, you can enjoy your Kindle books on iPad without worrying about the format incompatibility issue.